We are so excited to be blog hopping with one of our favorite new companies, Jaded Blossom! This company was started by Candace and Michelle. They decided to team up and create this business. Anyone who knows Candace or Michelle knows that these ladies LOVE creating party favors and little gifts. So naturally they had to come up with a business that caters to Party Favors and Stamps! If you have come from Jamie‘s Blog then you are on the Right Track and this is your final Stop! If not, please start back at Jaded Blossom’s Blog so that you don’t miss out on any of the fun and exciting summer projects! 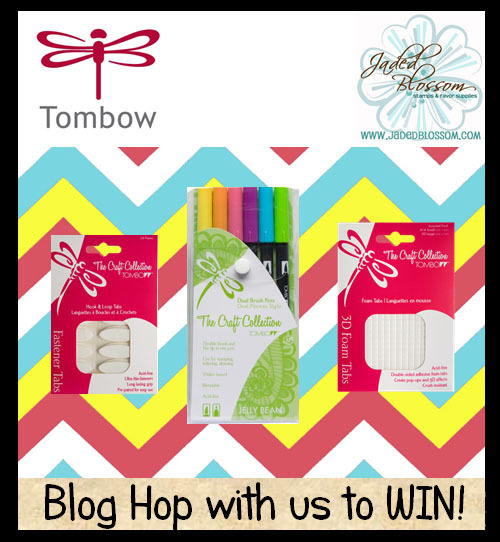 To be eligible to win, please comment on each Blog and don’t forget to “Like” the Jaded Blossom Facebook Page and “Like” the Tombow Facebook Page. awesome hop thanks so much! thanks so much for hopping with us !!! Thank you for Hosting this blog Hop!! Love your products!!! All I use is your Tombow aqua monoglue!! Love the hop. Everything was just wonderful and reminds me of summer. Great designs from the wole team! Awesome blog hop today. Loved all the projects and products used. I’m excited to try the fastener tabs, they sound like something I could really use with my projects. What a fun hop! Thanks for sharing your great products!! Love me some tombow!! I need some of those velcro fasteners!!! This was so much fun!!! All the projects were amazing…and so are all the products from Tombow and Jaded Blossom!!! a match made in heaven!!! Thanks for a fun and fabulous hop! Thanks for introducing me to Jaded Blossom! Such adorable designs! What a lovely hop! Thanks for hosting! Super fun hop! Loved everyones creations. I love your products. I need to get my hands on the Jelly bean makers. They look amazing. I can think of so many great things to do with those tabs! Thanks for the fun hop and the chance ofor all the great products. Amazing products !! Love love tombow !! Liked it all !! What a great hop! Love the products! Blog hops are so fun! Thanks for sponsoring this hop. The projects have been AMAZING!! I don’t have Facebook, so thanks for not making that a requirement. Love that I get to participate, anyway!!! Thank you for a fun, inspiration filled blog hop! This hop was so full of inspiration, thanks! Awesome hop! So glad a could be a part of it! Awesome hop! Love the Tombow products!! What a great hop! Thanks for co-sponsoring! FANTASTIC hop! The pairing of JB with Tombow = amazing projects, ideas and inspiration! Thanks so much for sharing allllll this creativity! Great hop! I loved seeing the fasteners used, I always wondered how they worked. And your markers are awesome, I have a bunch already and love them. Great projects. 🙂 Thanks for sharing. Oh my. So many great ideas, cute projects and everyone did such a great job of showing off the products. Love the new fasteners and how well they work. Love find new companies, especially with such great products. Nothing better than fabulous dies or markers. thanks for a fun hop. What awesome giveaways and new adventure! Awesome! I love the blog hop for great ideas.